Menaphos is one of the most exciting things to happen to Runescape in quite some time. 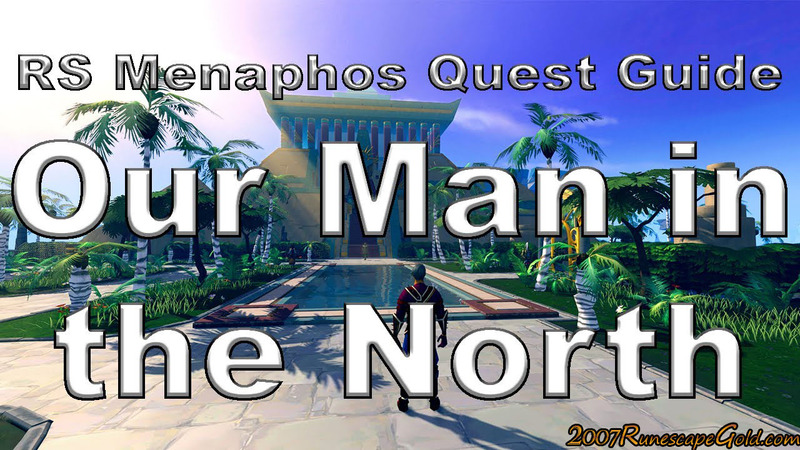 There is a ton of awesome quests that you can go on and one of the easier, quicker, but still very beneficial quests is Our Man In The North. Now while you probably have come here today to take advantage of our Runescape Gold Hot Sale! We suggest that you also keep on reading to see what this quest offers and while it is worthwhile doing. Ok so rather than us just writing what to do. The easiest way to follow how to od the Man In The North Runescape quest is actually with this video which is brought to us by ImSkovit, who is a YouTuber who has many good Runescape guides. What makes his guide the best is that it is quick, easy to follow and he shows actual maps of where you are supposed to go which makes doing this quest a lot easier and far less time consuming than some of the other, longer videos we have seen. So what exactly do you get for doing this quest? Well you do actually get some very respectable look from this quest. A Relic Of Het which is fantastic as you can use it to give you a reputation of 5'500 with any faction in Menaphos that you want. So as you can see it is well worth doing, especially when you consider just how simple and quick it is to do. We hope this helps you out and we would love to help you out more by inviting you to have a look at our Runescape Hot Sale which is offering you the cheapest rs3 gold online.